Monopoly Heights is powered by Bally Technologies and adds to the extensive list of Monopoly-themed slots from parent company Scientific Games. With 5 reels and between 1,024 and 32,768 ways to win, it can be played from 25p to £100 per spin on desktop, mobile and tablet devices. 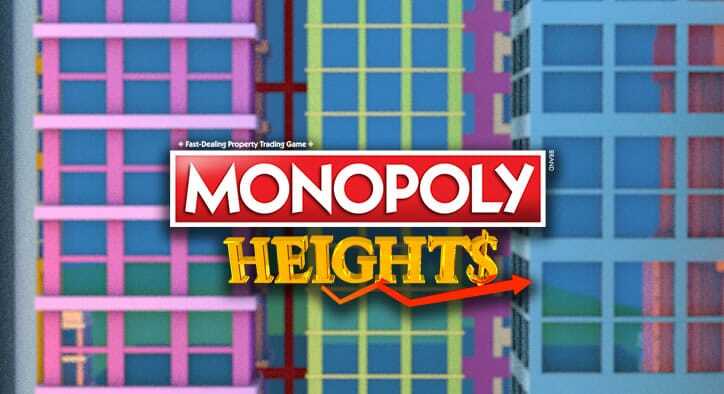 Visually, Monopoly Heights is rather nice – with cartoon graphics, you will see skyscrapers in the backdrop – symbols on the reels include A, K, Q and J royals as well as chests, cars, rings, coins, diamonds, the Monopoly Heights logo and Mr Monopoly himself. The latter 3 are the most rewarding giving you just 1 time your stake for 5 on a payline. The pair or die is the wild symbol and replaces all symbols bar the scatter – it appears on all reels bar the first one. Monopoly Heights comes with an Expanding Reels feature – this is played when you get any winning combination involving Mr Monopoly. All symbols then lock in position with 1 row added above the reels – a spin then takes place. After each spin where Mr Monopoly wins are formed or improved, those symbols lock in position and remain that way with another row added. With each win, the number of ways increases from 1,024 to 3,125 to 7,776 to 16,807 and finally 32,768 ways to win. The feature only ends when you don’t create or improve Mr Monopoly winning combinations or you have 8 rows – this will give you 32,768 ways to win. Monopoly Heights looks good but it’s not the best of slots when it comes to potential wins – the Expanding Reels feature is basically a streak spin feature where more Mr Monopoly symbols will give you more ways to win and bigger wins. It’s all about the Jackpot feature where the potential 2,500 times your stake is a decent amount to win – however, the likelihood is rather small. I would much rather play Bally’s Monopoly Millionaire which comes with lots of bonus features and a Super Jackpot feature where a whopping £1 million can be won!